even a fucktard knows that when a lightweight brittle 767 engine impacts a massive steel/concrete structure it diminishes in diameter. 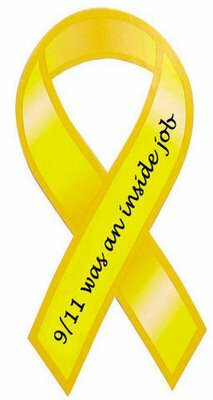 hey one doesn't even need to use science/mathematics to prove the official govt/media 9/11 fairytale wrong - all one needs is a tape-measure! More aeronautical expertise from our resident "shove a handmade wooden plane into a chicken wire tower" scientist. it seems that anonymous @ 8:09 does not have access to a simple tape measure. This explanation leaves a lot of questions unanswered. 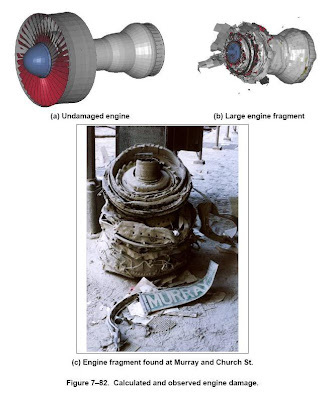 First of all, what is the source of the original 767 engine and fragment comparison? What is the orientation of the actual UA175 engine - is that the back or front at the top? And what if it is the center (Mae West) portion of a 767 engine, which is clearly smaller in diameter than the rear of the engine. Maybe both the front fan and rear portions were broken off. We need to take this a bit further for it to be a smoking gun. Here's some fact for you all. 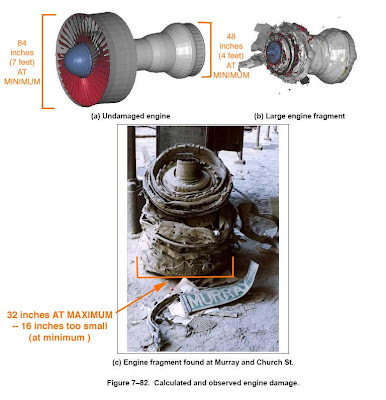 The engine has been confirmed as being a cfm-56 or a cf-6 which are from General Electric. United Airlines use stricky Pratt & Whitney. So whoevers job was to dump off that engine as a smoking, smoldering thing, DROPPED OFF THE WRONG ENGINE. Use reasoning & logic. I used to work as an industrial painter with my father. In the course of my job we used a swing stage on tall buildings. The counter weights used on the beams were 75 pounds each. We would pack these up in the elevator, usually 15-20 per beam. Upon completion it was far easier to just drop them off the roof and collect them out the vacant dirt lot next to door. Well in my haste to finish I inadvertently miscalculated one and it hit a walkway and broke a hole in the concrete and buried in 6 inches. This is 75 pounds from about 150 feet. What do you think a 5000 pound engine would do to pavement after a 1000 foot free fall? City sidewalks are only less than a foot thick as pedestrians and any other use does not require it to sustain massive stress. Think about it, what would happen if you dropped a Chevy engine block off an overpass? Result? I leave that to you. We need to take this a bit further for it to be a smoking gun.